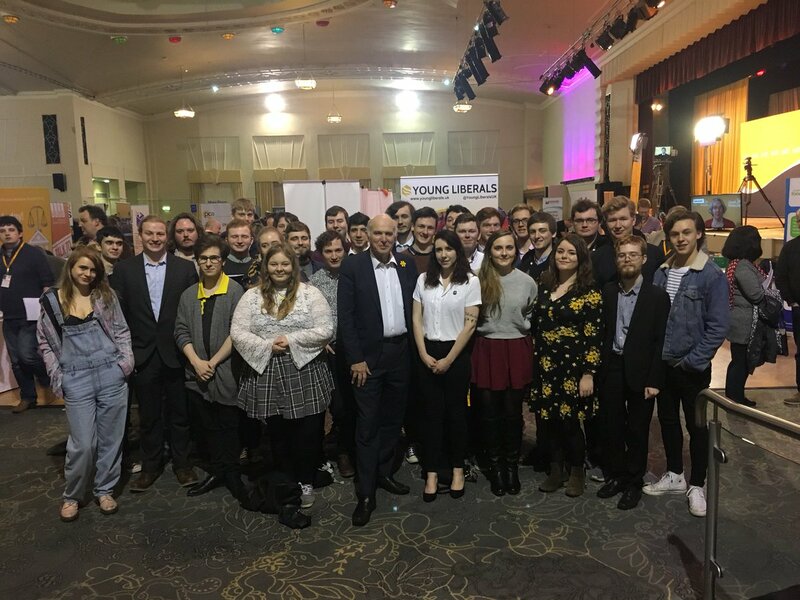 This year's Spring Conference at Southport had a very high turnout from Young Liberals across the nation. See below the day by day report of the Conference lowdown. We started off by opening the stall, which was placed by the entrance of the exhibition centre. As well as lot’s of Young Liberals campaign leaflets and merchandise, we ran a special Easter tombola, with a special bonus prize of a signed Nick Clegg book! The stall this conference proved to be a great success, with many Liberal Democrats from local parties all over the countries asking how they could get young people more involved in campaigning, being candidates, and general youth engagement of the party. During the opening rally, our very own Aria Babu gave a rousing speech on why she joined the Liberal Democrats and got involved in Young Liberals. She gave a shout out to the Young Liberals of the past whose radical actions helped made what the party is today, and that we should keep on being radical. With so many great speeches in the rally, the one that stood out the most was deputy leader Jo Swinson, who spoke about International Women's day, how the Liberal Democrats can be a force for ending gender inequality and discrimination, and the only progressive party tackling the pressing issues of today. Saturday came with two big policy motions being passed on Education and Rural Communities. Our new education policy, moved by Layla Moran, proposes to replace Ofsted, scrap SATS, have an overhaul of school league tables, and make sure all schools have the option of gender-neutral uniforms. Our amazing Jess Insall spoke passionately in favour of gender-neutral uniforms, a motion she and Scottish Young Liberals passed at Scottish Conference Last year, receiving an enthused and fantastic response from the crowd. During the Rural Communities bill, which calls for investment in our agriculture and countryside infrastructure, Scottish Young Liberals Vice President Jenny Marr gave an impassioned speech on the importance of healthcare and access to social services for those in rural communities. Many Young Liberals members played a role in voting to refer back the Macdonald Review, due to various concerns. Young Liberals are currently reviewing Party Disciplinary Procedures, we are working with critics of the motion alongside the English Party and Federal Board to ensure that our party’s Disciplinary Procedure is fit for purpose and is one that our members can trust. We also had two training sessions. The was first was ‘Young and Winning’ run by Cllr Ellie Hudspith and Cllr Ben Dowling, where they provided training on running for candidacy selection and being a candidate in elections. The second was how to win the youth vote in local elections with, Robin Rea, our Co-Chair Thomas Gravatt, and Ed Dyson. The final day of conference saw us raise £185 for Young Liberals from our tombola. We would like to thank everyone who donated to our stall. Young Liberals Donations go towards helping us fund action days for candidates, getting young people to conference, and so much more! Young Liberals also challenged the newly proposed party strategy. We pointed out that many elements of it were not fit for purpose due to being too vague and vacuous. The party strategy passed and now we at Young Liberals are working on our criticisms to constructively improve the strategy, whilst seeing how Young Liberals as an organisation can work towards implementing the strategy. In conclusion, Spring Federal Conference had a very high turnout of Young Liberals and we had a great many achievements. Look out for more news on ‘Activate’, our Young Liberals Summer Conference, which will be held in Swansea, and Autumn Federal Conference in Brighton this year!